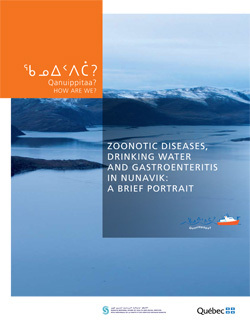 In Nunavik, common practices such as the consumption of untreated water and raw game may promote exposure to pathogenic agents responsible for zoonoses, infections that may be transmitted from animals to humans, as well as for food-borne and water-borne infections. As part of the 2004 Nunavik Inuit Health Survey, information was gathered to depict the supply of drinking water and to determine the prevalence of certain infections among the Inuit population, including gastroenteritis. The results reveal that the region and socioeconomic characteristics (age, education and revenue) of the main respondents (n = 521) were associated with the supply of drinking water in households (source of drinking water, type of treatment used in the house and frequency of cleaning the domestic reservoir). Approximately one third of households draw their main water from a natural source and this practice is more common among respondents aged 50 and over, those with a lower level of education and those living on the Hudson’s Bay coast. Participants with a higher level of education, those with a higher individual income and those living along the coast of Ungava Bay are more likely to use filtration to treat the water they use in their homes. However, domestic reservoirs are cleaned more frequently in households in the Hudson Bay region. In terms of infectious diseases, the survey documented the prevalence of gastroenteritis over a 30-day period among members of the households participating in the survey (n = 2550). The results indicate a weighted overall prevalence of gastroenteritis of 9.6%, with higher levels among the extreme age groups. Although meat preparation methods, overcrowding, the main source of drinking water and the type of water treatment used by the household are not associated with episodes of gastroenteritis, frequent cleaning of the domestic water reservoir does seem to have a protective effect, which suggests that drinking water may possibly be involved in the transmission of gastro-intestinal infections. Blood tests among adults aged 18 to 74 (n = 917) allowed for the verification of the seroprevalence of antibodies for eight zoonotic diseases: trichinellosis, toxocariasis, echinococcus, brucellosis, leptospirosis, Q fever, toxoplasmosis and tularemia. Although cases of these diseases are rarely declared in Nunavik, the results indicate that the Inuit population is exposed to the micro-organisms responsible for some of these infections, particularly Toxoplasma gondii. T. gondii infection also seems to be associated with frequent consumption of marine mammals, feathered game and fish, as well as frequent cleaning of the domestic water reservoir. Nevertheless, individuals who eat cooked seal meat and those who mainly drink bottled or previously filtered or boiled water appear to be infected less. In terms of zoonoses and water-borne or foodborne illnesses, particular attention must be paid to personal hygiene measures in preparing and handling food. Given the uncertainty regarding potential sources of T. gondii infection, it is important to continue to recommend that seronegative pregnant women and immunodepressed individuals avoid consuming raw and insufficiently cooked meat. It would be wise for the entire population to avoid consuming untreated surface water that has not already been boiled, and this is particularly true for at-risk groups. Furthermore, efforts should continue to properly identify the microbiological risks associated with drinking water in Nunavik.